Is it Quanset, Quonset, Quansit, or Some Other Spelling? Is it Quonset, Quanset, Quansit, or Some Other Spelling? With over half a century of popularity, the arch-steel buildings we know and love have many names such as Quanset. What’s the most popular spelling? Here’s a chart comparing the three most common spellings in Canada. Quonset is in blue, Quanset in red and Quansit in yellow. You can see that Quonset is by far the most dominant spelling at all times of the year. So now we know that quonset is the most common spelling, but is it correct? It turns out it is! Quonsets were first manufactured in a naval factory at Quonset Point on Rhode Island. It’s from that location that it gets its name. The point itself is thought to be named for an Algonquian First Nations word meaning “small, long place”. While that name may seem to describe the buildings perfectly, it would be referring to the point itself which juts out into the Atlantic. Are there other words for this type of building? Spelling variations are one thing, but you’ll also find a variety of different words referring to similar types of buildings. The key here is that each of those different buildings types have subtle differences. Nissen huts for example are a precursor to Quansets and typically have an internal wooden support structure. Romney huts were introduced around the same time as Nissen huts and used in WWI by the British. Forget spelling, where can I get one? Ok, ok, we get that spelling isn’t the most important thing here. If you’re looking for your own arch style building please get in touch with one of our sponsors. 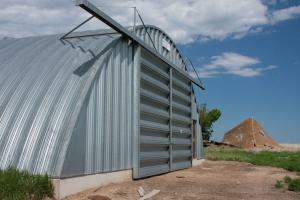 A building specialist will help find the ideal quonset solution for you! Where did the name Quonset come from?